Ok, so the below is stuff that I made up. I'm positive that Dave is a great guy and would never do any of the stuff below, but it was just one of those days. All I did was look at the picture and make up something relatively humorous. So please, if you meet Dave, don't go "Dude Dave, did you really tear someone's legs off??". And don't ask any of the other members o' the band cuz... they'll probably look @ you strangely & walk away. Apparently, during the filming of the Monkey Wrench video, one of the craft services people (you know, the people with the food) didn't make Dave's coffee how he liked it. So, as an example, Dave is showing everyone what will happen to them if they don't obey him. DAVE: See that? He didn't listen to me and look what happened to him. TAYLOR: God, Dave, I mean, you didn't have to tear his legs off. After the coffee thing, Dave made Taylor "audition" for the part of his girlfriend in the Everlong video. He asked Nate to help him make sure that Taylor was good enough. Nate was a firm believer that Pat would be better, and Taylor really didn't wanna do it, but Dave slyly convinced him that it was for the best. DAVE: OK, now Taylor, you need more helpless victim... There you go! NATE: Pat would be better. DAVE: Shut up and keep walking! Now see Nate, see how he's looking more... feminine? 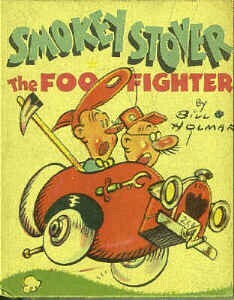 Yep, its the long lost Foo Fighter! Poor Smokey here got lost in the giant mosh pit at one of the Foo's concerts and was never seen again. Is that Dave I see sitting next to him? Thanks to Curtis, the creator of Oof Brand Toofoo and Foo Fire, for letting me use this.